Anyway, I call this blog "GrowinginPreK" for a reason. I'm not just referring to the amazing growth of four-year-olds over the course of ten months. I am also trying to grow as a teacher every day. The Literacy Beginnings books study made me want to "share the pen" with my young students this year. We all get stuck in ruts. One of my ruts was thinking that at least I was doing shared writing with my young students. I was showing them how it was done, wasn't I? So, I determined to give them opportunities to write during circle time this year. Even so, I didn't expect it to happen this quickly! On our second day of school, I introduced the big math journal. Just as last year, I had the kids spell their names to me and show me which number to list them under (how many letters in our names.) Today, day three, I started to do the same thing with how many boys/girls are in our class. One little boy asked me, "why do you always have us tell you how to spell it?" I realized he was right. I started over and had the kids come up and write their own names. Only one needed my help with the letter "r." They loved it. Wow. This is going to be a great year. This chapter provides many examples of ways to encourage our young students to start putting their thoughts on paper. I like all the specific phrases that Fountas and Pinnell listed for teachers to say to students to encourage their early writing efforts. Basically, the word "good" is not good enough. I sometimes find that I read material like this, plan to incorporate suggestions into my future teaching, but close the book, and forget the specifics. So, I made a cute list of some of my favorite phrases from the chapter. I am going to display it in my classroom and refer to it when I am working with kids on writing. We begin journals during the first days of school. I keep it simple by passing out blank white paper and markers. At the beginning of the year I am looking for pictures and names. (I date and file the pages.) I move around the room writing sentences dictated by the kids as called for. It is amazing to see the development in the pictures over the year. Many of the children add letters and words over time. I love the "speech bubble" idea that Karen shared yesterday http://prekinders.com/2011/07/literacy-beginnings-chapter-16/. I can't wait to try that. The writing center is always available during center time. I try to keep it engaging with student name cards, envelopes, Magnadoodles, dry erase boards, stencils, and alphabet stamping markers, etc. http://www.growinginprek.com/writingcenter.htm. I ask families for recycled paper at the beginning of the year. The kids don't mind using the blank side of old letterhead or office copies. There is also new blank paper available when both sides matter. Leslie gave some great tips on making blank books in her blog about chapter 15: http://nomoreworksheets.com/2011/07/learning-to-write/. Rotating materials can really increase interest. (Cute seasonal pencils are very appealing.) It seems like writing "clicks" for many of the students each February when the writing center is stocked with materials to make valentines. I include some words like Mom, Dad, and " I love you" for the kids to copy. The kids get very involved in making cards for parents and friends with the words "I love..." This tends to carry over into their journals. Aarohi wrote family members' names without any help. Lauren was able sound out "pup" when journal writing that she loved her dogs. She used visual analysis to write "my" and "love" since she was very familar with these words. On a student's birthday, I fold a piece of construction paper into a card, write Happy Birthday John on the front, and have all the kids sign inside. This year, that activity lead to students creating birthday card extravaganzas for each other in the writing center. The one below was created by a group of girls for one girl in the class. They taped it together. One of the girls wrote everyone's name as part of the card. Setting up a post office in the dramatic play area also prompted a lot of writing. I model these activities in shared writing. The children provided these suggestions for what they were going to do if it snowed tomorrow (which didn't pan out, but was a very exciting prospect in the Texas Gulf Coast at the time). The authors mention having students write the letters in the air. This has been a fun and very popular circle activity in our room. They remind us, as teachers, to be consistent in demonstrating how to form letters. They provide Appendix H with descriptions of the "verbal path." In Appendix D, Lesson 7, they suggest that "pairing the verbal path descriptions with motor movements helps children form letters efficiently. Eventually, they will internalize the language, and the actions will become automatic." I think these are great suggestions. I like to add activities such as writing letters in salt or on Ziploc bags filled with paint as an additional option for kids who do not yet have the fine motor skills necessary to hold a a pencil correctly. Here is a great link if you would like more ideas for helping children develop fine motor skills:http://writeoutofthebox.com/tips.php. I have attended workshops presented by Marianne Gibbs, EdD, OTR/L, the creator and presenter of Write Out of the Box!® . She is a registered occupational therapist. She offers a lot of good information about having kids cross the midline and the development of the tripod grasp. The authors describe how to teach with these techniques during shared/interactive writing. Basically, you want the children to discover how to say the word aloud/slowly and listen for sounds and identify which letter to write. We work on these skills with tins of magnetic letters. ( I really want those tiny lunch boxes that dollar stores sometimes have. They would be easier for students to open and handle.) We start out by figuring out how to make words like "in" or "it." We work up to word families. We use the same activity for Monitoring and Correcting Words. The authors suggest working with a text produced through shared/interactive writing. The teacher uses prompts such as "Find a word that starts with (letter)." So far, I have just been doing this with shared reading. I will have to branch out and try this with something we have written in class. We do lots of class books as extensions of literature we have read. At the beginning of the year we work a lot with names. After reading A My Name is Alice, I had each child find the letter that his/her name started with and glue it on the page. We worked together to come up with things they liked that started with the same letter as their names. I did the writing and they did the illustrating. In January, after reading One Mitten, we created our own version of what a mitten could be. I have the picture below because I was so delighted by the wonderful job that particular student did with such an abstract concept. There is a printable of the page below if you would like it. In April, the kids really enjoyed reading Quick as a Cricket and reflecting on some of their own qualities to make this book. At this point in the year, most of the kids could figure out what letter a word started with and asked for help in spelling the rest of the word. It Looked Like Spilt Milk provided a fun painting and writing activity. The writing leant itself well to having the kids use sound analysis to construct words. They painted pictures such as the sun, the moon, and flowers. They could identify beginning and ending sounds and needed less help to write the words. The pages never made it into a book because we loved them on our bulletin board. So far, I have only used mentor texts to inspire class books. The authors suggest using them to encourage children to make their own books about topics that they know and care about. I will give this a try in the upcoming school year. I can tell we are going to be VERY busy this year. What do you do in your classroom to encourage young writers? Please comment with your ideas. Tune in tomorrow for Matt's discussion of Chapter 18 The Reading-Writing Connection. I feel very fortunate to be blogging about Chapter 12: Using Shared Reading to Support Emergent Readers. Shared reading is really one of my favorite activities in Pre-K. Ask anyone I work with, my walls are always covered in songs or poems either written on chart paper or displayed in pocket charts. Reading (and often singing) these materials together as a class is a fun part of our daily routine. I believe that shared reading allows each child to pick up skills needed for reading at his own pace without any pressure. It naturally meets the diverse needs in a Pre-K classroom where one child is being introduced to letters for the first time and another child is starting to read words. While a large group of kids may be following along on the same text at the same time, one may be noticing that one word starts with the same letter as his name, one may grasping the idea that text flows from left to right, and another may be blending a c-v-c word. They are engaged at their own level and enjoying the comfort of participating with the group. Last March (rodeo time in Texas), our morning shared reading was a song written on chart paper: “There is a state, It’s the Lone Star State, and Texas is its name-o, T-E-X-A-S, T-E-X-A-S, T-E-X-A-S and Texas is its name-0.” The kids loved singing it together so much that they begged for opportunities to sing it alone while I pointed to the words on the chart. I have created a pocket chart poem of the familiar “See You Later Alligator” rhyme to illustrate the authors’ guidelines for a shared reading. -	The print should be very simple and easy to see. -	The print should be large enough for the whole group to see easily. -	There should be clear spaces between words and between lines. -	There should be a limited number of lines on a page. …You can sometimes add a picture at the end of a line to help readers remember the words (but don’t leave out the word). -	There should be simple punctuation marks that the children can notice and use. -	Illustrations should be clear and simple and illustrate the meaning of the text. Here are the first four lines of “See You Later Alligator.” I created this printable to fit in one of the pocket charts available at Target this time of year for yes- one dollar. (I will no longer be emailing the pdf). Comments are still welcome. Likes on Facebook are also appreciated. Okay, now I sound like a late night commercial, but if this deal is not good enough… I will also include a pdf for you to print as a book for your classroom. My kids love to have books like this that they can read independently in the book center. This could also be a book that you read during closing circle each day. I suggest printing the pages and putting them in clear page protectors in a binder or three-prong folder. Years later, I still remember a wonderful college reading professor telling us about Marie Clay’s observations in using big books with children who had previously had no experience with books. I decided right then, that big books would be a major part of my classroom. The authors also pointed out that while many children’s books are being published in big book size, the ones that work best for shared reading are the ones with less text on each page. This gives the kids a better opportunity to “notice visual signposts.” I really like the big book of Cookie’s Week by Cindy Ward because it has few words per page and the kids can really follow along. I was delighted when Scholastic Book Orders made a variety of big books available for a reasonable price (whether dollars or points) at back to school time last fall. I hope they will keep it up! Some of the very best big books are also the teacher-made ones. I like going to teacher workshops where you take something free home and use it in your classroom. I also love teacher websites and blogs with free printables. So…here are two simple shared readings texts that I have created to fit the Target dollar pocket charts. I suggest printing them on cardstock and then trimming them to fit. The pictures are from Discovery Education Clipart. The simple black on white print and the illustrations at the end of each line are intended to facilitate shared reading in a Pre-K or Kindergarten setting. You can start with three or four lines and add more as your class seems ready. •	Be sure that all the children can clearly see the print. •	Point using a long, thin stick, not your finger. (This one made me smile because once in a while I try to rush and use my finger . In a minute, one of the kids always brings me my pointer). •	Keep the momentum going. •	Keep sessions short, gradually lengthening the sessions slightly as children’s attention span increase. Step 3 Teach children the poem, song or rhyme first (in absence of print) so that they can say it together. I will try this when I introduce “See You Later Alligator” this year. I have always introduced a poem with the written version, but I will try saying it without the written text first and see how this goes. I think this will be especially relevant at the beginning of the year since the kids won’t be used to seeing a teacher point at written text yet. I look forward to hearing thoughts and ideas from all the wonderful teachers who are following along on this book study! Vanessa has a great post for Chapter Five: Using a Framework for Language and Literacy Teaching. This chapter covers both 3-hour and 6-hour schedules for a typical Pre-K day. My program falls somewhere in between. The students come to school for five hours, but leave my classroom for an outclass (Spanish, Music, P.E., or Library) for 30 or 40 minutes each day. I use this pocket chart with pictures as a guide for the students. After a few weeks of school, they relate the days of the week to the various outclasses. We also read a morning message each day with wording such as, "Today we go to P.E." The second item in the pocket chart, "blue bins," refers to fine motor activities. Once each child has unpacked his/her backpack, he/she chooses one of these activities. A maximum of two children may play with each tub at a time. I find this really works well during the 20-minute arrival window for many reasons. * Helps kids transition from saying good-bye to parents to something they can't resist in the classroom during the first days of school. * Open-ended: They don't feel frustrated if they have just started to do something and it is already time to come to circle as they would with a puzzle or game. * Easy for the kids to tidy up independently (no lids, etc.). * Great fine motor practice. * An ice-breaker for quiet kids to start talking to one other child. * Frees me up to greet children as they arrive and take lunch count etc. During the first days of school, I have the trays out on the tables in the morning for simplicity. Later students choose them from the rack. The trays were $2.50 in the Target Dollar Spot and the rack is really for shoes. The classroom routines that the authors describe sound very much like my own. I do have my class library organized in tubs, there are many books that we have made as a class available to the children, we do a lot with shared reading and writing. We include songs and movement in our calendar routine. One thing I do handle differently than suggested in the chapter is the assignment of classroom jobs. The authors mentioned assigning students jobs for a week at a time. I choose a new line leader each day for one simple reason. I have 12-14 students. If they each get to be leader for a week, someone has to wait three months for a turn! Three months is an eternity when you are four years old. The line leader becomes the door holder (second in line) the next day. Those are my only two job titles. The duties for the day (Calendar, lunch helper, etc.) are split between them. I try to incorporate phonemic awareness all through the day. Sometimes when we line up I will call the kids saying, "If your name rhymes with do, line up..."
Finally, the example of a parent newsletter/email provided in the chapter is very similar to the weekly emails I send. In addition, I frequently upload photos of the kids in action to our free class Shutterfly site. I get a lot of positive feedback from parents about being able to see what their kids do at school on this password protected site. I also use the calendar on it to send out reminders about special days at school and to schedule parent conferences. Even though I chose a picture without faces, it is easy to see how engaged these learners are! My thought for this chapter is short and sweet: I am going to offer more opportunities for inquiry learning than I have been doing. Do you have any suggestions from your classroom? Please share a comment if you do! Deborah Stewart has done a wonderful job of covering the second chapter for our blog book study. Be sure to visit her blog at http://www.teachpreschool.org/ to read her insights. One thing the authors suggested and I have not yet done, is to make a simple chart for the kids to follow for arrival routines. I love this idea and plan to use photographs of actual items in our classroom to list routines such as putting away lunches and water bottles. The authors also provided a great list of "Twenty-Five Ways to Use Circle Games to Create Community." I do something similar to an activity that they suggest with a rolling ball. 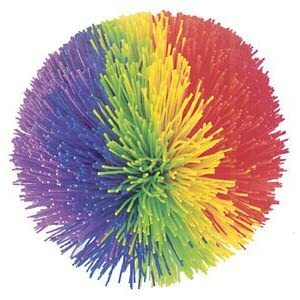 I have a Koosh ball that I throw to kids so they will know it is their turn to answer the given question (favorite food, a book you like, etc.). It keeps things fair, gives shy students a chance, and provides a little gross motor work. I also create a class book at the very beginning of the school year along the lines of Brown Bear, Brown Bear. The pages incorporate the students' names and photos (Emma, Emma, who do you see? I see John looking at me...) They love hearing their names read and looking at classmates faces. In fact, I have to be careful to add pages when new students join our class. This becomes a very popular book in the Book Center for the rest of the year. I wasn't planning to include the photo of myself reading Literacy Beginnings this soon, until I saw Vanessa's today. I couldn't believe our pictures were so similar! I guess we are thinking along the same lines. I agree with everything Vanessa has pointed out so far about including literacy in early childhood classrooms. (Thank goodness reading this book is not going to make me change my whole approach to teaching, just give me some new tools and support). Why did I spend hours today creating a "button" that other bloggers can "grab"? Because, I am delighted to be one of the early childhood blog authors participating in a book study linky of Literacy Beginnings: A Prekindergarten Handbook. We will begin on June 27th. Here's a link to Pre-K Pages for more information. Vanessa also has a link to some pages from the book. It looks like just what early childhood teachers have been waiting for!